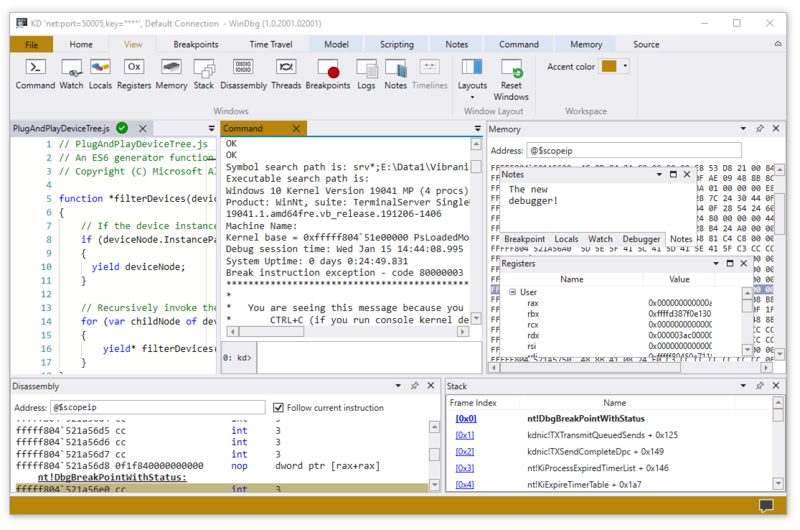 WinDbg Preview is a brand-new version of WinDbg with more modern visuals, faster windows, a full-fledged scripting experience, built with the extensible debugger data model front and center. WinDbg Preview is using the same underlying engine as WinDbg today, so all the commands, extensions, and workflows you're used to will still work as they did before. Here's some of the most notable things that have changed or are new. Easier Connection Setup and Recall - The WinDbg Preview includes the ability to recall previous session configuration information. Dump file processor detection -Auto-detects processor architecture for easier managed debugging. Performance Improvements Windows now load asynchronously and can be canceled - When you run another command, WinDbg Preview will stop the loading of your locals, watch, or other windows. 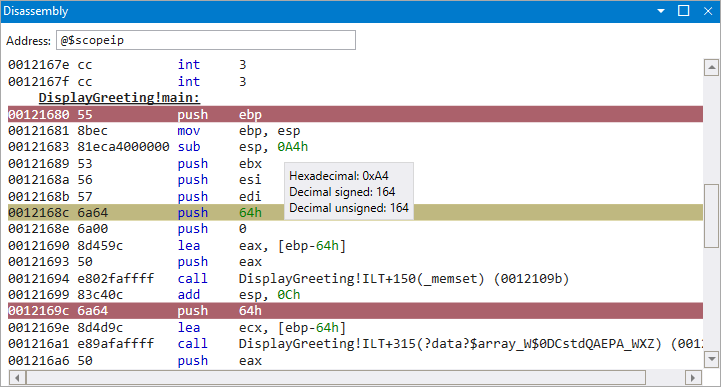 Disassembly Window Improvements - The disassembly window is also improved, the highlight of the current instruction remains where it is when you scroll. Memory window improvements - The memory window has highlighting and improved scrolling. Logs - This is a under the covers log of the WinDbg Preview internals. It can be viewed for troubleshooting or to monitor long running processes. For more information, see WinDbg Preview - View menu. Command window - Use the command window provides easy access to toggle DML and clear the debugger command window. All current debugger commands are compatible with and continue to work in WinDbg Preview. Use File > Settings to enable the dark theme. Just pin the buttons you use the most and you can collapse the ribbon to save screen real estate. The source window has been updated to be much more in line with modern editors. The command window has two new highlighting features. Selecting any text will give a subtle highlight to any other instances of that text. You can then hit "Highlight/Un-highlight" or Ctrl+Alt+H to persist the highlighting. Just hit Ctrl+Tab and you can easily navigate between windows with just your keyboard. If you need a TTD trace of your application, just check the "Record process with Time Travel Debugging" box when launching or attaching. WinDbgNext will set it up for TTD and open the trace when you're done recording. For more information, see Time Travel Debugging - Overview. Debugging your universal app or background task is now a single click. For more information, see Launch App Package. The attach dialog is faster, more detailed, and is easier to use. Enable/Disable breakpoints - The breakpoints window shows all your current breakpoints and provides easy access to enabling and disabling them. Hit count - The breakpoint window keeps a running total of each time the breakpoint is hit. For more information, see Breakpoints. Built in data model support - WinDbg Preview is written with built in data model support and the data model is available through out the debugger. For more information, see WinDbg Preview - Data model. For more information, see WinDbg Preview - Scripting. 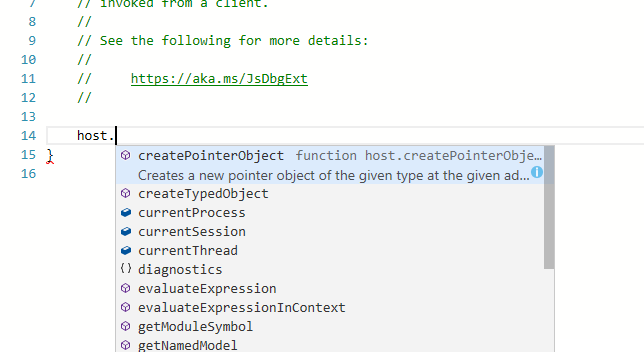 Because the underling debugger engine is the same, all of the previous debugger commands and debugger extensions continue to work. Your feedback will help guide WinDbg's development going forward. If you have feedback such as a feature that you really want to see or a bug that makes something difficult, use the Feedback Hub. Watch these episodes of the Defrag Tools show to see Windbg Preview in action. Defrag Tools #182 - Tim, Chad, and Andy go over the basics of WinDbg Preview and some of the features. Defrag Tools #183 - Nick, Tim, and Chad use WinDbg Preview and go over a quick demo. Defrag Tools #184 - Bill and Andrew walk through the scripting features in WinDbg Preview. Defrag Tools #185 - James and Ivette provide and introduction to Time Travel Debugging. 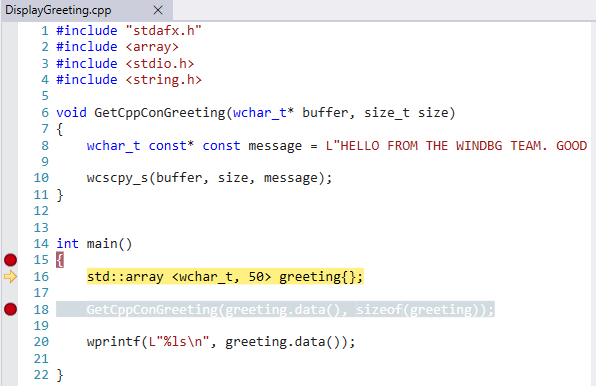 Defrag Tools #186 - James and JCAB covers advanced Time Travel Debugging. For information on what's new in the most recent release, see WinDbg Preview - What's New. Review these topics to install and configure WinDbg Preview. These topics describe how to get connected to the environment that you want to debug. These topics describe some common tasks, organized by the menu tabs.